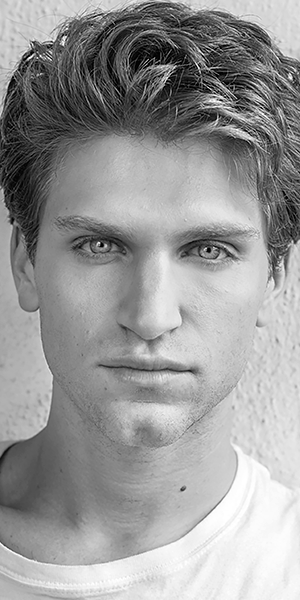 Keegan Allen wants to share his experiences with you. 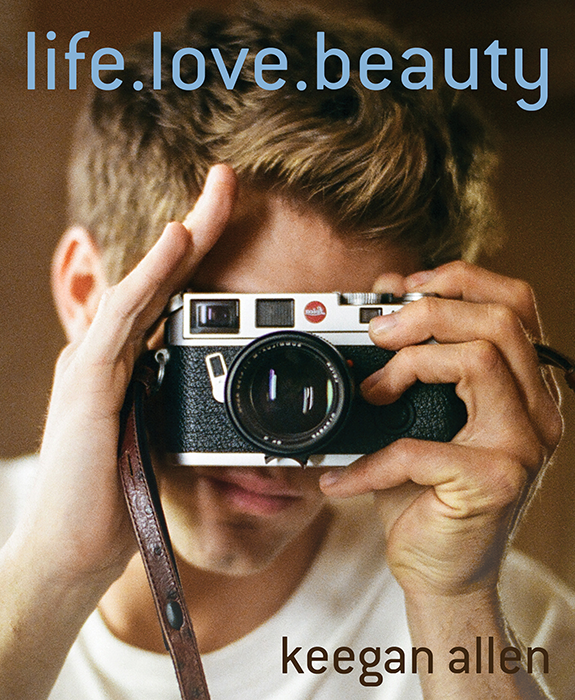 Best known for his role as Toby Cavanaugh on ABC Family’s hit television series Pretty Little Liars, the 25-year-old star is proving his versatility with next week’s release oflife.love.beauty, a candid and intimate multi-media journal of his life that collects everything from poetry to prose to music and lyrics, to above all, photographs. Featuring a range of self-portraits, observations of everyday life, and snapshots of celebrity friends such as Emmy Rossum,James Franco, Jay Leno, Emma Roberts, and the cast of Pretty Little Liars, Allen’s book beautifully announces the arrival of a true and unique visionary artist. In advance of the February 3rd release of life.love.beauty (via St. Martin’s Press), Allen chatted with me about his creative process and all of the inspirations, fears and goals that went into putting this book together. Plus, he reveals his favorite Pretty Little Liarsfan theory about A’s identity! NAGORSKI: You started your career exploring photography, writing, music, and cinematography before stepping in front of the camera to be an actor. What made you decide to return to these passions and interests and share them with the world? ALLEN: Well, before I ever started my formal training as an actor, I was very much entranced with photography and the element and idea of sharing these moments from a really, really young age. When I was 10-years-old, I recognized the concept of taking a photo, waiting a couple of days to get it developed and then sharing it. I just really loved the entire process of it. I think the most rewarding point was sharing it and hearing the experience others had with it – how somebody could take a photo and it’s of something as mundane or uninteresting as a leaf on the ground but paired with certain words or certain lighting and such, it provokes a different feeling. Art is so subjective. So I just really enjoyed being able to share those experiences with others. That’s kind of what the book is for me. It’s half my experiences but it’s also an interactive thing that anybody can open up to any page and either find a retrospect that fits their own lives in that kind of situation or find an inspirational shot or experience for the future. What type of creative itches do photography and writing scratch for you that acting doesn’t? They all scratch my back equally in a way. When I’m not acting, I’m always photographing, and if I’m not photographing and acting, I’m playing music or writing, so I’m always dipping my toes into other things. Because Pretty Little Liars has gotten a lot of attention, it’s given me a great platform to share my passion through this book with fans of the show and other readers as well. I guess it gives me the power and the control of using photography as an important means of human communication. It’s also kind of latching onto these ideas of life, love and of beauty because they’re things that we all live through. These are things that really affect us and compose our existence. There’s also an idea that I play with in the book and that’s that we’re all kind of living basically the same lives but we just have different names and we all are backgrounds to other people’s lives. Then those people are backgrounds to our lives sometimes and we don’t take the time to kind of acknowledge that we’re all living in this life together and experiencing very, very much the same feelings, so that’s the kind of the itch I wanted to scratch. I like that question a lot. Thank you! The book chronicles your life and observations growing up off of the Sunset Strip. Tell me a little bit about your creative process and how you curated this narrative using the mixed visual and literary mediums featured throughout? The way that it came about is … I grew up in Hollywood. I would skate around with my camera everywhere. My father had given me a camera at a very young age to borrow, a Leica M6, which is a very nice camera to be just playing around with. But I brought it with me everywhere and I stayed around with my friends and lived like a fly on the wall to our experiences. Whether they were vapid day-to-day moments or they were transcendent epiphanies of growing up, I logged them in my book, similar to how people blog today on Tumblr. I would carry around a composition notebook and when I would get my photos developed, I would take a negative and make a contact sheet and maybe cut out the image that I wanted and so on. I was constantly creating content and that was kind of the idea. I included a lot of my child mind in this book. I didn’t want it to be a didactic autobiography but rather be something that, like I said before, anybody could pick up and experience in their own way. That was done just through constantly sharing the moment. Since this book is an intimate photo journal of sorts, your fans will undoubtedly get to know you far better than ever before. What’s something about yourself that you think will surprise your readers to learn and did you ever worry about exposing too much? Yeah, I did. It’s really nerve-wracking. The most challenging part of this book was sharing the personality behind it. Art – and any kind of imagery – is subject to criticism and ideas and those could be right and they could be wrong and they could be neither of the two. It’s a little nerve-wracking to think of the ways that it’ll be perceived but I think readers will get to see a side of me that’s a little more emotional and that my heart is very much stitched into my work. There’s also an element of darkness and light that plays into the book. There’s a feeling to it about how opposites attract and then they attack. But I think the overall element of it will be that people can take away their own experiences from it, which is exciting. You touched on this before, but one of the primary themes that ties this collection together is the dissection of the idea of Hollywood. What is it about this place that fascinates you so much and is there a specific message or thesis about it that you’re hoping those who read the book take away with them? Yeah, I mean, everybody reveres Hollywood as being this holy Mecca of the entertainment world. They see the industry as sparkling lights and somewhere that anyone can make it and that there’s no real work involved. You just kind of get in and do it. I love that. There’s so much speculation. A lot of people that come here don’t know that. On the flipside, it’s also a beautiful and kind of tragic place. We so easily judge what we see before we understand it ourselves, and I’ve always been really fascinated with this. There’s this idea that everything’s very transient in Hollywood and that everybody kind of moves around. I grew up there next to everyone that talked big and was crazy, but also small underdogs, and all of these were key characters in my personal life. There are also the places that everyone kind of knows of, whether it’s the Chateau Marmont or Venus Beach. These are iconic places and I wanted to give readers a little bit more of a look at them – from my own perspective and experiences but also ones that anybody can understand themselves. Hopefully this gets people to go there and force an inspirational moment upon themselves. Do you have a favorite photo, poem and/or piece of writing in the book? Yeah, I have a few. But everything’s really close to me so the way that I look at the book is so close to my face that I can’t really pull back and get “this is my favorite” from everything. That being said, my first photo that I ever took has a lot of meaning to me. I remember that day really vividly and there were so many elements to the photo that I did want and ended up sharing in the book. It was such a unique experience. I took this photo and my shirt was wet, so I wiped the lens with it so it gave it this really soft effect and there were fireflies flying into the light meter so it was bouncing on and off and silhouetting the image. It has all of these things that otherwise nobody would have known about. So I really love that image a lot. That’s one of my favorites. You’ve collaborated frequently with James Franco over the past few years, appearing in films like Palo Alto, The Sound and the Fury, and the upcoming Bukowski. As someone who’s published quiet a few books of his own, did he give you any advice when you were preparing for the release of your book? Yeah, he did. He is extremely supportive and thoughtful. He’s included me in so many things. James is not only someone that I look up to a lot, but he’s a really good friend too. He has this personality of “just do it and see how it makes you feel and see how it affects others but always make sure you base everything in truth,” which is such a cool outlook. When I showed him the concept for the book and shared with him some pictures that I wanted to include, he was just immediately very supportive. Everybody has been. In fact, I think what I’m the most grateful for – being able to have such an amazing group of friends that supports my passions and my craft so much. Switching gears briefly to Pretty Little Liars, what’s the craziest fan theory you’ve heard about who A is? I’ve heard a really crazy fan theory that the viewer is actually A. As if there’s a voyeuristic villain that once they break the fourth wall, they realize it’s actually been the audience the whole time. I kind of like that one because it’s just very out there. Is there anything else you’d like to add about the book or any upcoming projects that we didn’t talk about? Just that I’m really excited about it! I’m going on a book tour and am looking forward to being able to meet everyone that wants to share this experience with me. It’s going to be really, really rewarding. The book itself is only half of this experience. Half of the book is just in what it is right now and the other half will be the interaction with the readers. I’m just really thrilled that everyone has their own experience through life, through love and through beauty and I can’t wait to share that with the world.